The Oscars are sort of like America’s yearly junior prom, in that we always make a huge deal about the show, and then the next day talk about how disappointing the whole thing was and think of ways to maybe make it better next year. But don’t worry, because this year the people behind the Oscars have a foolproof plan to make them great: Entertainment Weekly reports the 2016 telecast will feature two hosts, because history never, ever repeats itself, meaning this plan will go perfectly. 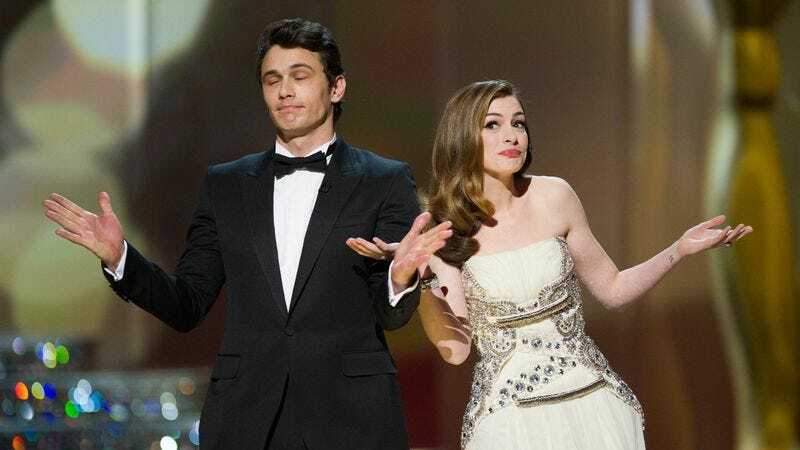 David Hill, a former Fox executive, and Reginald Hudlin, former entertainment president of BET, are producing this year’s show, and presumably have no excuse for not knowing how the Anne Hathaway-James Franco experiment went. Hell, being partnered up as hosts even neutered Steve Martin and Alec Baldwin, so what hope does anybody else have? Feel free to offer your own suggestions in the comments, as we suspect Hill and Hudlin will soon be turning to us for advice, once their desired choices remember that hosting the Oscars is an utterly thankless task, and refuse.